NEW YORK - After dawdling between small gains and losses in a slow day of summer trading, the stock market ended little changed on Monday. Instead of worrying about the conflict between Russia and Ukraine or trouble in the world's other hot spots, investors appeared to sit tight. The main reason, said Robert Pavlik, chief market strategist at Banyan Partners, a wealth management firm, is that the news that's most likely to move the market comes out later in the week. On Wednesday, the Federal Reserve wraps up a two-day policy-setting meeting, then issues a statement that investors will study for any hints about the Fed's next interest rate move. On Friday, the government releases its closely watched monthly jobs report. "If you're a professional investor," Pavlik said, "the big things you focus on this week are what the Federal Reserve says Wednesday and Friday's monthly employment report." 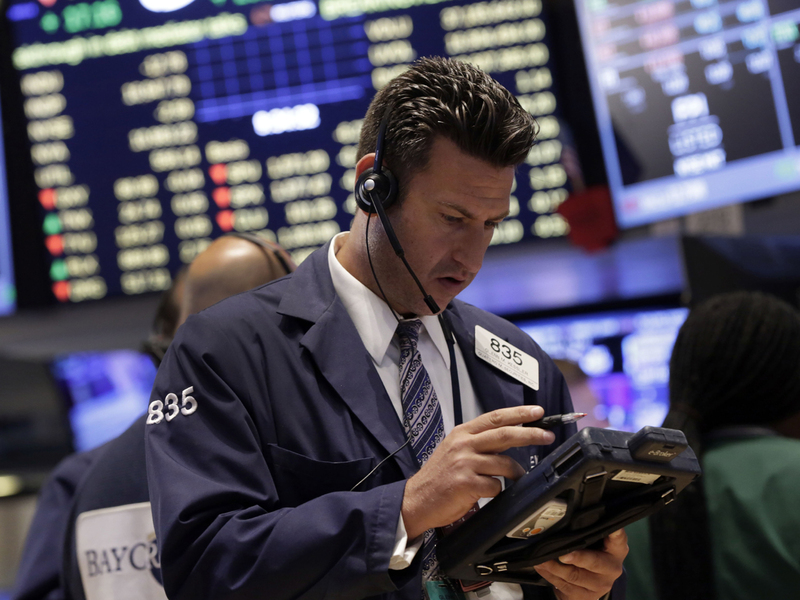 A scattering of merger announcements drove some trading on Monday. Family Dollar (FDO) rose the most in the Standard & Poor's 500 index -- with a 25 percent gain -- after Dollar Tree (DLTR) announced plans to buy the rival discount store for roughly $8.5 billion. Family Dollar's stock surged $15.08 to $75.74. Trulia (TRLA) jumped on news that Zillow (Z), a rival real-estate listing service, was buying it for $3.5 billion. Trulia advanced $8.69, or 15 percent, to $65.04. Zillow picked up $1.46, or 1 percent, to $160.32. The S&P 500 index edged up 0.57 of a point, or 0.03 percent, to close at 1,978.91. The Dow Jones industrial average rose 22.02 points, 0.1 percent, to end at 16,982.59, while the Nasdaq composite slipped 4.65 points, or 0.1 percent, finishing at 4,444.91. Wall Street is in the middle of second-quarter earnings season, when big companies turn in their springtime results and tell investors how they think the rest of the year will shape up. This week, Exxon Mobil (XOM) and MasterCard (MA) are among the heavyweights posting earnings. American Express (AXP) and Merck (MRK) report Tuesday. So far, the news has been better than many expected. Of the 229 companies that have posted results, nearly seven out of 10 have turned in higher profits than analysts projected, according to S&P Capital IQ. Among the handful of companies reporting Monday, Tyson Foods (TSN) announced higher quarterly profits as well as a plan to sell its chicken business in Mexico and Brazil for $575 million in cash. Tyson Foods climbed $1.02, or 3 percent, to $40.56. Tensions between Western powers and Russia remained a concern for investors. On Monday, an international court ordered Russia to pay over $50 billion to a group of investors for the expropriation of now-defunct oil company Yukos. The ruling comes as European countries consider imposing sanctions on trade in defense, technology and other goods and restricting access to European capital markets for Russia's state-owned companies. "I think the market is doing what it should be doing," he said. "It's not getting sucked into all the bad news out there. Russia is lobbing bombs into Ukraine, and that appears like it could spiral out of control. The Middle East looks out of control. But the stock market is trading near an all-time high." In other trading on Monday, France's CAC 40 rose 0.3 percent while Germany's DAX shed 0.5 percent. Britain's FTSE 100 slipped 0.1 percent. News that profits at China's industrial enterprises soared 17.9 percent in June over a year earlier suggested that the world's No. 2 economy has stabilized and gave Asian markets a boost. China's benchmark Shanghai Composite Index surged 2.4 percent. The price of oil fell as traders awaited this week's economic reports. Benchmark U.S. crude oil fell 42 cents to $101.67 a barrel on the New York Mercantile Exchange. Brent crude, a benchmark for international oils, fell 82 cents to $107.57 on the ICE Futures exchange in London. BONDS: In U.S. government bonds, the yield on the 10-year Treasury note inched up to 2.48 percent from 2.47 percent late Friday. Bond yields rise when prices fall.